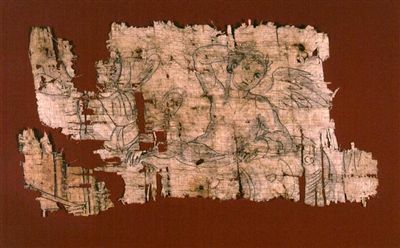 A papyrus with a scene from the myth of Amor and Psyche drawn with black ink on the recto. Here Psyche is shown - on the left, with butterfly wings- , probably kneeling beside her spouse, holding in her right hand an object identifiable as the lamp that will reveal him. Amor is depicted on the right, with bird wings, half-reclining on the bed. G.Coppola, in Papiri della Società Italiana, vol. VIII, Firenze, 1927, pgg. 85-87, tav. III. AA.VV., Papiri dell'Istituto Papirologico "G.Vitelli", Numero 1, Firenze, 1988, pgg. 32-33, n. 31.